2018 marks the 24th year that MDA, Shaw’s and Star Market have partnered together to sell MDA Shamrocks. 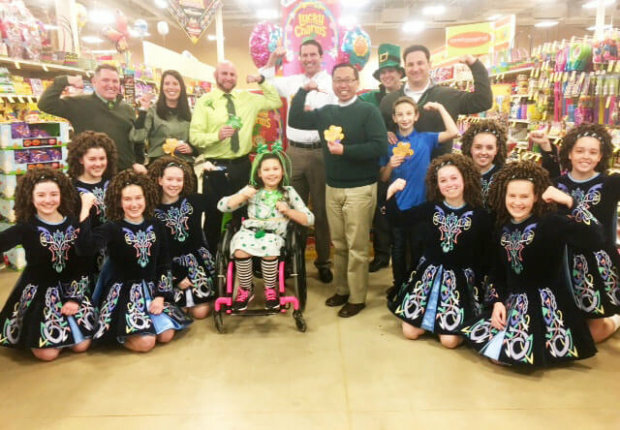 To date, the New England-area grocer has raised more than $4 million selling MDA Shamrocks since the partnership began in 1994. In the process, Shaw’s and Star Market have become staunch supporters for those in their communities living with neuromuscular disease. This is mirrored by their parent company, Albertsons Companies, which operates under 20 well-known banners, including Albertsons, Safeway, Vons, Jewel-Osco, ACME, Tom Thumb, Randalls, United Supermarkets, Pavilions, Haggen, Carrs and others. 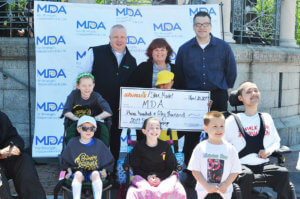 For 36 years, the MDA Shamrocks campaign has become a staple at retailers throughout the country. As of 2017, the annual St. Patrick’s Day campaign has raised more than $316 million, with more than 20,000 retailers participating. In stores, customers can purchase green $1 or gold $5 paper Shamrocks, each with a picture of someone the campaign is helping. The Shamrocks are then pinned in a prominent area of each store. For Shaw’s and Star Market, partnership with MDA traces to 1994, when the campaign was featured in seven locations in Maine. Today, the campaign can be found at all 154 Shaw’s and Star Market stores throughout Maine, Rhode Island, Massachusetts, Vermont and New Hampshire. That commitment to MDA is also found in their parent organization, Idaho-based Albertsons Companies. The impact of the MDA Shamrocks campaign cannot be understated. “The funds go toward vital MDA services and research,” Spellman says. “Our Summer Camp program is a service where those raising money can see a tangible impact of the dollars they raise. It is a chance for children with neuromuscular diseases to get outdoors, do a lot of great things, be independent and make friends. It’s a very enriching experience. According to Teresa Edington, manager of external communications and community relations for Shaw’s and Star Market Foundation, this year marks the company’s most ambitious fundraising goal yet. Although all Shaw’s and Star Market locations sell MDA Shamrocks, each individual store has the autonomy to raise money in other ways. None of this could be done without the commitment of Shaw’s and Star Market employees. Twenty-four years in, the partnership is as strong as ever. Last year, Shaw’s, Star Market and MDA had a check presentation ceremony at the Boston-area Muscle Walk, and there are plans for a similar presentation this year. According to Edington, the day of Muscle Walk is a meaningful capstone to the Shamrocks campaign, and a way to strengthen the partnership between the grocers and MDA. Help find treatments and cures for adults and kids living with muscular dystrophy and related life-threatening diseases with MDA Shamrocks.